Imagine if a Jewish rabbi or Christian priest had called for the killing of Muslims: there would be an international outcry, and he would have been fired before there was even any press attention to his remarks. But this will get little notice. He will be “retrained,” no doubt in making sure not to say things in public that could come to the unwelcome notice of the Infidels, and that will be that. JTA – The imam of a New Jersey mosque will be sent for “retraining” after delivering anti-Semitic sermons. 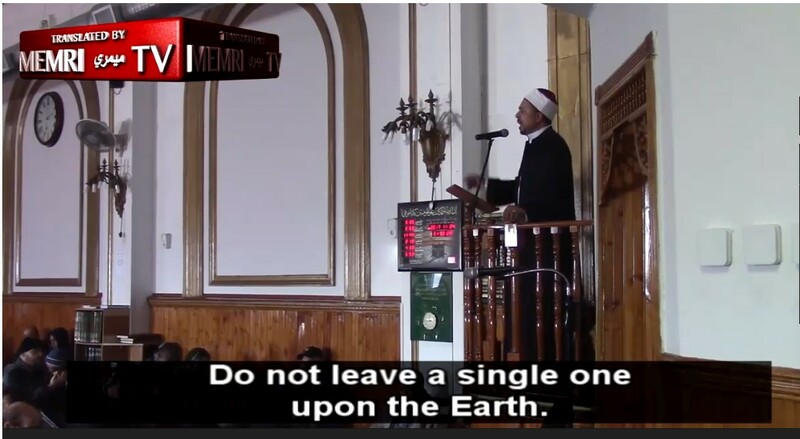 Sheikh Aymen Elkasaby, imam of the Islamic Center of Jersey City, in a sermon earlier this month, called Jews “apes and pigs,” and urged his followers to: “Count them one by one, and kill them down to the very last one. Do not leave a single one on the face of the Earth.” A translated transcript of his sermon was published by the Middle East Media Research Institute, or MEMRI. Shedeed said he was not present in the mosque for either of the speeches. He noted that the Islamic Center in Jersey City had been located there for forty years. Shedeed also has served as a member of the New Jersey Homeland Security Interfaith Advisory Council. As someone who lives in NJ this started wiith Christie defending a Hamas Imam Mohammad Qatanani. And some crooked cops and feminists and Neturai Karta thought he was a man of goodwill. I am so ashamed what is going on in NJ. You also have some radical Middle Eastern Christian groups for example the ADC which the founder is originally from NJ who is a Christian Arab Samer E Khalaf.